One of the advantages of being in France is that from time to time (not often) you can be offered a local French historical collection of books. In this case it was the malacological library of Léopold Pons d'Hauterive. I could not find any birth or decease dates, but he was active in the second half of the 19th century, a time in which French malacology flourished as never before (and perhaps never after). In that period two important movements were opposing each other. There were people like Crosse and Fischer who were responsible for the Journal de Conchyliologie, and a group centred around ''la bête noire'' of 19th century French malacology, Bourguignat. He had a specific view on how molluscan species should be defined. In short his theory was that each species should be separated by at least three different characters. This gave rise to a multitude of species descriptions. Sometimes each local lake in France would have their own endemic fauna. As the group around Bourguignat needed their own society and journal, the Bulletins de de la Société Malacologique de France, together with the Annales and the Revue were founded by 12 French Malacologists in 1884. In the collection there was a small pamphlet in the same format as the Bulletin, stating that in a meeting on 28 November 1883 the board was assigned as follows: President: Servain, Vice-Pres. : Locard, Secr. : Mabille and De Rochebrune, Secretary-General: Bourguignat. There were 34 members, 17 of which were French, among whom was Léopold Pons d'Hauterive, from Espalion (in the region of Aveyron). Although Pons d'Hauterive was very interested in malacology, he was not one of the important figures of the time. As far as I could ascertain he described only one species: Helix liypsellina. Unfortunately, just before posting this news item, more than half of the collection has been sold to one of my customers; including sets of the Bulletin and the Annales. But for instance the very interesting set of the Revue Biographique de la Société Malacologique de France still is for sale. A collection of portraits and biographies/bibliographies of French malacologists including: Servain, Locard, Mabille, Rochebrune, Bourguignat, Fagot, Saint-Simon, and Ray, Letourneux, C.M.F. Ancey, J.M.L.F. Ancey, Poirier, Reynès, Jousseaume, Massot, Lamarck, Draparnaud, and Pechaud. The revue is a very important source for finding biographical and bibliographical data on some of the lesser known French 19th century malacological authors (and some of the better known as well). The portraits are well executed and were specially made for the revue. For a few malacologists these portraits are the only ones existing (or at least available). Furthermore about 20 other items from this collection still remain, which can be found in my next malacology catalogue to be issued in February. The foundation for the Zoological Museum Amsterdam was laid when the gentlemen Westerman, Werlemann, and Weismuller founded the Zoological Society 'Natura Artis Magistra' in May 1838. Due to lack of live animals, the new Society board, formed by the three aforementioned gentlemen, started by buying a set of stuffed animals. The first collections of the Society's Zoological Museum were mainly educational and did not meet the requirements of present-day scientific collections. This situation changed in the 1870's. The first, a scientific assistant was employed by the Society (R. T. Maitland). Secondly, a new building was erected in 1872. 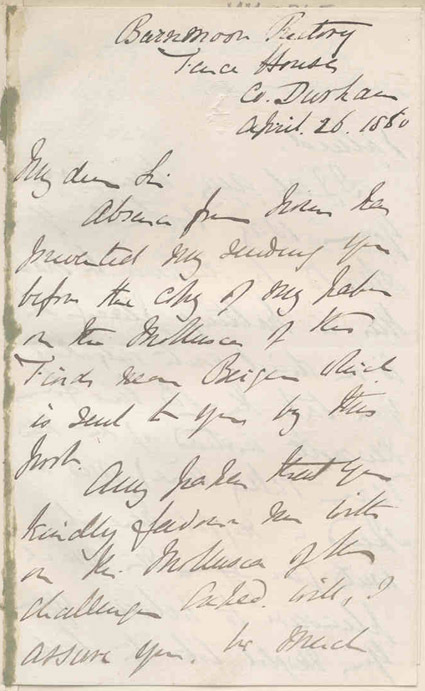 In an agreement between the Municipal University (Gemeente Universiteit) and the Society it was arranged that the collections of both were united. The cooperation between University and Society and the shift in ideas about scientific collecting gave a big impetus to the development of the zoological museum. Within about a decade, c. 1875-1885, the collection changed from a show with samples of the beauty of nature to a much larger scientific collection. Many collections of all groups of animals were received between 1880 and the 1930's, from private persons and institutions from all-over the world, and especially from the former Dutch colonies (present-day Indonesia, Surinam, and the Netherlands' Antilles). Important additions included large samples of natural history items which had been on show on the First International Trade Exhibition in Amsterdam (1883) and the rich marine collection of the Siboga-expedition (1899-1900), organized by Max Weber. During the economic recession of the 1930's, the Society neared bankruptcy. The idea arose of selling the more important collection items, like the last Quagga, the Great Auk with its egg, the Norfolk Island Kaka, and other rare or extinct animals for which important sums of money could be obtained in the USA. The planned auction was cancelled when the Municipality of Amsterdam and the Province of North-Holland bought all possessions of the Society in 1939. The entire zoological collection and library came to the Municipality, and so entirely became part of the Municipal University. Increased availability of money after World War II and a rapidly growing number of interested biology students led to a new boom in development of the zoological collections from the 1950's to the 1970's. The collections became better housed: originally scattered over at least 10 old buildings mostly in and around the zoo, the museum gradually concentrated in a smaller number of more suitable buildings, especially after the change from Municipal University to the governmentally financed University of Amsterdam. Recently the University stopped funding the Amsterdam Museum, and the collections and most of the staff moved to the National Museum of Natural History in Leiden. 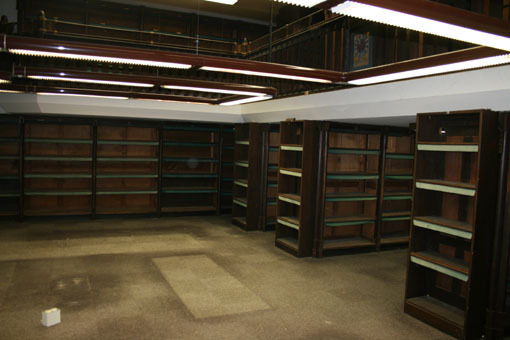 The library was dismantled. I managed to obtain what was left of the library of the Zoological Museum. The older books were donated to the Artis library (Amsterdam), the National Natural History Museum (Leiden) took those books that were wanting in their library, and the former employees could buy books from what was left. I subsequently bought what remained. Although much thinned out, there were still 3000 books left. The collection was especially rich in books on vertebrates (Birds, Mammals, Fishes and to a lesser extend reptiles and amphibians). In the invertebrate section the collection is especially rich in fields like Crustacea and Annelida, but less so in Malacology (much sold to previous employees) and Entomology, as the museum staff had access to the library of the Nederlandse Entomologische Vereniging (which is among the richest entomological libraries in the world). But still an very interesting addition to my stock, which includes many hard to find titles. 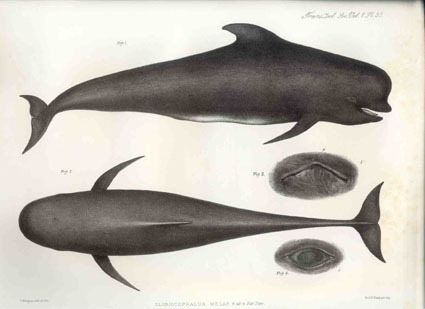 The next catalogues including books from the library of the Zoological Museum of Amsterdam are: Malacology, Marine Mammals, and Invertebrates (including the large and interesting collection of Polychaete books and many hundreds of Polychaete reprints). These will be issued in February. Others in preparation are: Entomology, Crustacea and Terrestrial Mammals. Swammerdam, J., 1669 (1st ed.). Historia Insectorum Generalis, ofte Algemeene Verhandeling van de Bloedeloose Dierkens; , 168, 48 p., 13 (12 folded) hand coloured engraved plates, 2 vignettes, 1 folded table, contemporary (or slightly later) half vellum with marbled boards (boards somewhat worn). One small hole in first blank end paper (repaired). Some plates browned. Some very slight scattered foxing (mostly in first few pages). Library stamp at rear of title-page ''Grosherzogliche Bibliothek Neustrelitz'' (with discard stamp dated 1950). This copy includes pages 11-12 of the ‘’second part’’, which is like a title-page for his chapter on insect classification, and is according to Schierbeeck (1946: page 228) often missing. Jan Swammerdam (1637-1680) studied medicine at Leiden University and developed an interest in biological research, especially in physiology and entomology. Although Swammerdam died at a very early age, he certainly is one of the most important Dutch scientists of the 17th century. 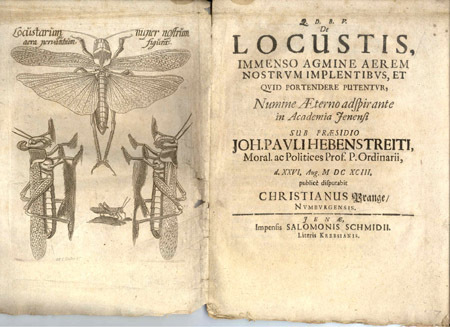 Together with Ephemeri vita of afbeeldingh van ‘s Menschen Leven… (1675), the Historia Insectorum Generalis is the only entomological work by Swammerdam that was published during his lifetime. A work of great scientific merit. In this work Swammerdam laid the foundation of modern insect-classification, which still rests to a great extent upon the developmental history of insects. He also proved wrong almost everything then believed about insects. Since Aristotle, the theory on insects was based on three suppositions, insects lack internal anatomy, they originate by spontaneous generation and they develop by metamorphosis. The idea of metamorphosis was that a sudden and total change from one kind of creature into another. 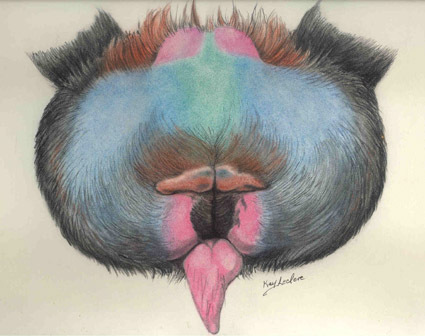 The above works by Swammerdam demonstrate his mastery to observe, describe and depict (with the primitive means available at his time) the most complicated details of the, often minute, animals he investigated. 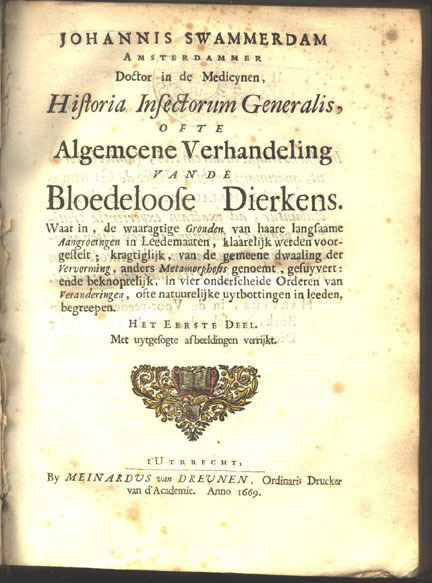 I am quite happy to be able to offer the very rare first edition (in Dutch) of this book which is considered, together with the works of Redi and Malpighi, to be the starting point of modern entomology and microscopy. The first edition was written in Dutch; there were later editions in French (1682, 1685) and Latin (1685, 1693, 1733 & 1755). This copy has all 13 plates, the two vignettes and three capitals hand coloured. No coloured copies of this book are known. 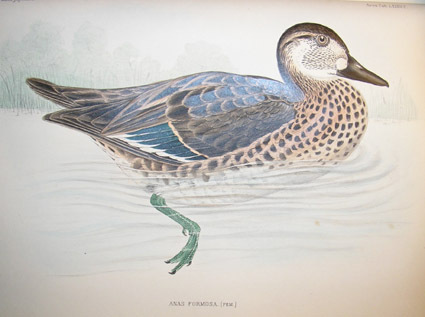 At least Landwehr does not mention it in his book ''Studies in Dutch books with coloured plates published 1662-1875: Natural history, topography and travel, costumes and uniforms''. And further research in library and sale catalogues did not reveal any reference to coloured copies of this book. In fact very few copies of the first edition have been offered the last 20 years, and it seems rarer than later French and Latin editions. In this particular case I believe that the colouring was done 76 years after the appearance of the book, as underneath the first plate there is the following inscription in an old hand, and in the same yellow colour as the plate border: 1745 No. 5 (see photograph). The meaning of ‘’No. 5’’ is not clear. So if in strict sense the colouring is not contemporary, it is certainly not recent as it was done 264 years ago. 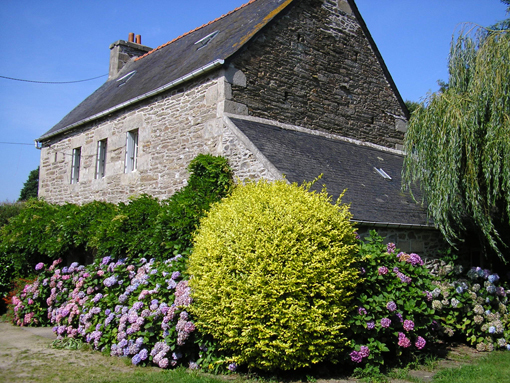 I will officially move from the Netherlands to Brittany on December 15 (2007). 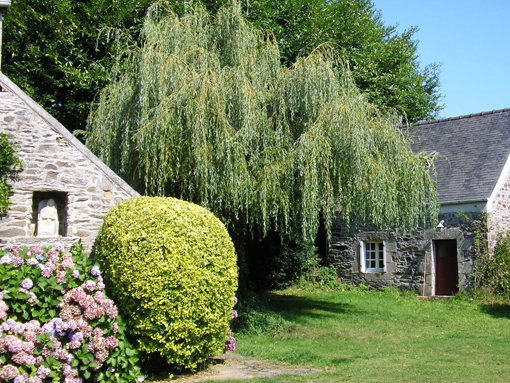 From that date I will be exclusively working from my new address: Porzh Hervé, 22780 Loguivy Plougras, Brittany, France. Any e-mails sent to the Netherlands will not be lost, but will take more time to reach me as they will be forwarded to me as soon as possible (which is not always the same day). I am now based in the rural countryside were the pace of life is slower (so is my PC - no ADSL!). Here I hope to put on sale the remaining several thousand titles that are still to be added to my database. An important advantage is the increase of space to store my books. The first catalogue issued from my new premises will be one on Botany with over 850 titles. The one after will be a new Malacology catalogue. Next year, when all the books are here and I am firmly settled, I hope to be of even better assistance to you and I will hope to find you just that book that isn't for sale anywhere else! From 14 to 19 June 2005 I made a small trip to Hay on Wye (UK) in the company of three good friends Frans de Jong, Erwin Kompanje and Frans Slieker. Hay on Wye, being the UK capital of books with about 34 bookshops, is a beautiful little village which is set in an equally beautiful surrounding landscape. Of course we were there primarily for books, but although some books were bought in the first couple of days, nothing exceptional was found. One of the last days we visited some of the more distant shops outside the village. We entered one of these shops and I was quite disappointed as the walls were lined with bookcases full of cheap pocket books. 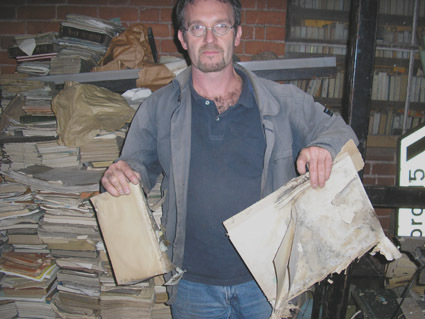 But as we got to the back of the shop we found a pile of Discovery Expedition reports that were interesting. Suddenly Erwin came to me and said: ‘’Look through the window at that shed outside, it is packed with books!”. 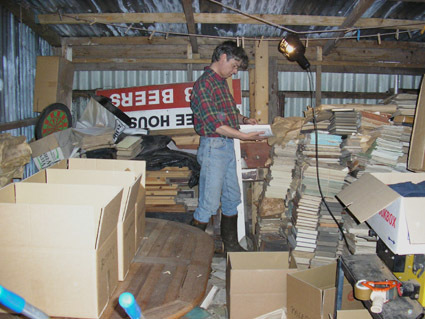 So we took a closer look and indeed, the shed was filled with older natural history books and journals. We were intrigued. What is this pile of 3 meters wide, 2.5 meters deep and at least 1.5 meters high, doing in a doorless shed with a tin roof? A talk with the owner revealed that it was actually ‘’overstock’’ from the well known Natural History book dealers Wheldon & Wesley. 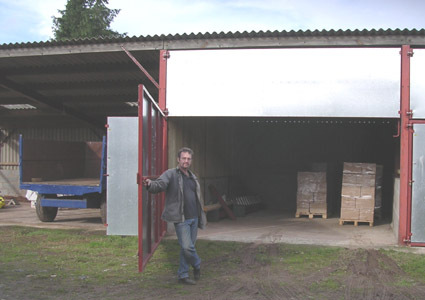 When this company moved from Lytton Lodge near London to their new smaller premises they could no longer store this part of their stock. 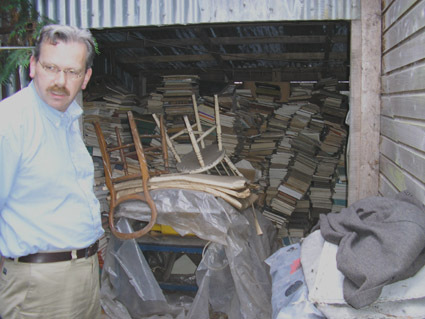 Subsequently it was sold and the new owner went over with a local truck (used for cattle transport), brought all of the books and piled them in a shed. There they remained practically dormant for several years. Meanwhile, after 164 years in the business, Wheldon & Wesley ceased trading in 2004. I was now to decide if I would buy this pile of books or not. A first look through the piles proved interesting enough, and logistic problems (moving the greater part of 11 cubic meters of old paper to The Netherlands) I thought of as a challenge. So finally I decided to acquire the entire lot. We took about one box of good and interesting items back with us, and I started making plans to bring the entire stock home. Together with Frans Slieker I returned to Hay on Wye at the end of July. We had planned two whole days to sort all the books and put them in cardboard boxes. Meanwhile we decided to discard the part which was commercially not interesting. The idea was to load my van with about 40 boxes, the rest would be piled on five pallets for a transport company to bring the lot over to the Netherlands. Although we worked hard enough, we only managed to work ourselves through half of the pile. We had to come back again! In the meantime I used some of the material for a malacology catalogue which was issued in September 2005. Practically all of the Wheldon & Wesley material included in this catalogue was sold, which was encouraging. Frans Slieker and I had to go back now to finish the job. And so we did at the end of October. This time we planned an extra day, and stayed for three days. 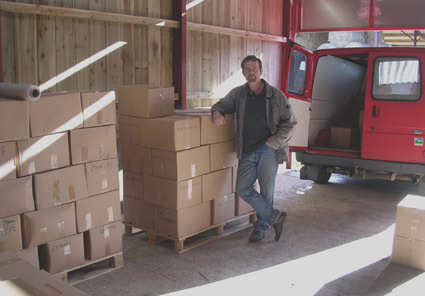 We filled my van with another 40 boxes, and the rest was piled on five pallets which were brought to the Netherlands by a Dutch transport company. They arrived on the 10th of November. The condition of the books of course was not very desirable, but considering where they were housed in one could perhaps call it astonishingly good. 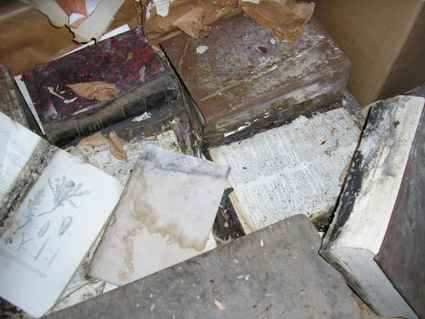 Many piles were put directly on the floor, and the first 10-20 cm of books were totally useless as they were badly damaged by moist. 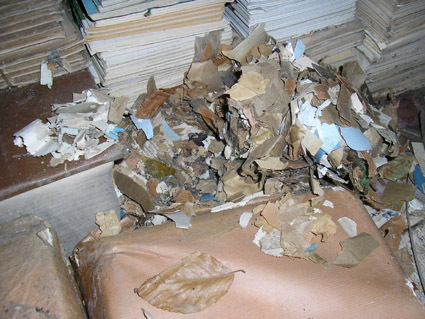 All pages stuck together to form a solid clump of paper, blackened by growth of fungus. 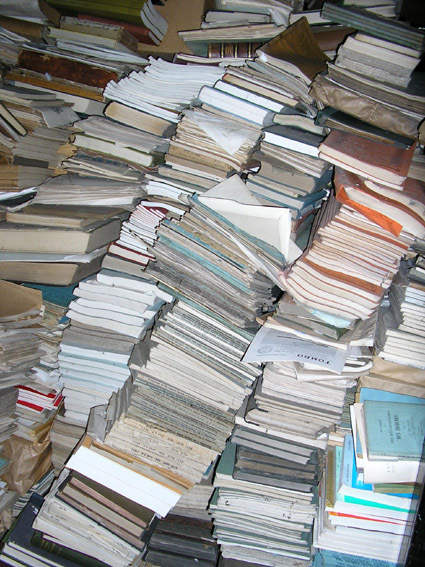 Some of the books on the outer sides of the pile had suffered as well, but everything within the pile was quite well preserved...... except for a few rat nests here and there. Luckily the first layer of books mostly consisted of large and useless library reference books [there were good reference books as well, among which a complete copy of the original edition of the Library of the British Museum (Natural History)]. I was quite saddened to find a collection of good 19th century entomology reprints and books with hand coloured plates reduced to useless paper pulp. But still at the end at least 220 boxes with useful material were brought back. There were some bizarre things among the many books, reprints and journals found. The following pictures are not for the faint hearted: prudish people and small children would better not look at them. First we found a collection of original paintings of monkey bottoms, made by Frances Woodhall in the 1930’s. 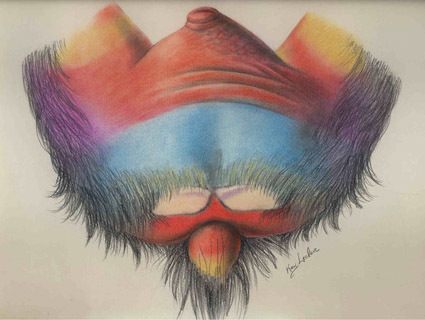 But the two Mandrill bottoms made by Kay Leclerc could be almost considered improbable abstract art (now in the private collection of monkey bottom paintings of H.L. Strack). I could not find any reference to these pictures, and would be very interested if someone could give me some information about what kind of research was involved and whether these plates were published. 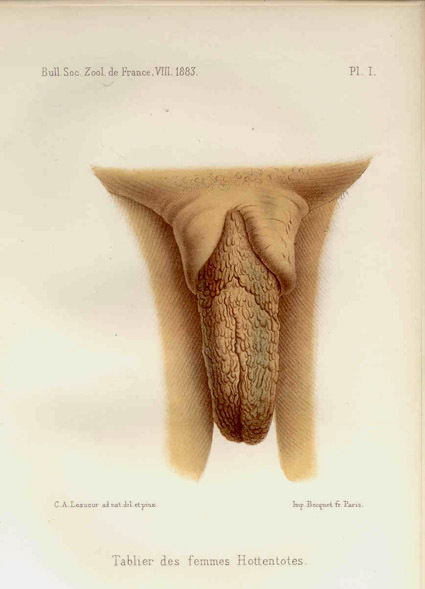 And than (and I will stop this chapter here, being at risk that my customers will think I am a pervert of some kind) there is a French paper published 1883, titled ‘’Observations sur le tablier des femmes hottentotes’’ by the famous French explorers and scientists F. Péron and C.A. Lesueur. They start their paper as follows: ‘’Si l’existence du tablier des femmes hotentotes est un des phénomènes les plus curieux de la physiologie de l’espèce humaine, l’opposition des voyageurs à cet égard en est un autre non moins singulier peut-être’’. Their paper is followed by a paper by Dr. Raphaël Blanchard on the same morphological phenomenon found in female bushmen, and who made a more thorough and well illustrated study. Those who are not acquainted with the French meaning for the word tablier (in the sense used here) may make a lucky guess. Of course there were many more ‘’normal’’ items found, of which some quite interesting. 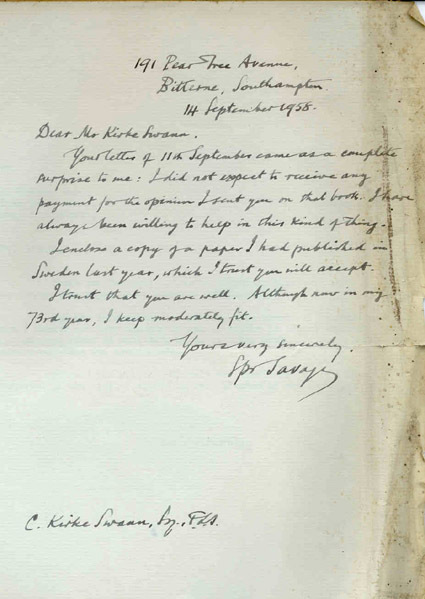 There were old cash books from the Wheldon & Wesley firm, old letters of scientists found in reprints, and a lot of interesting 19th century papers many with coloured plates and some 18th century ones and even one 17th century paper on grasshoppers. 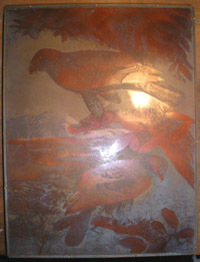 Peculiar were also some of the original copper plates used for Swann & Wetmore’s ‘’A Monograph of the Birds of Prey’’. They were found together with piles of loose plates from the same work. They will be sold separately together with a copy of the plate they represent. In the same category were the many piles of plates and text issues of Dresser’s monumental work ‘’Eggs of the Birds of Europe’’ of which we made a good selection but had to throw away more than half. 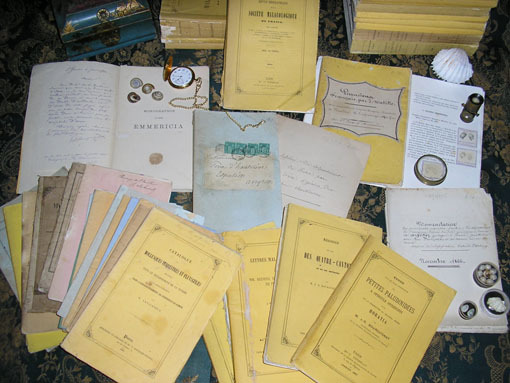 Many journals including the Bulletin of the Zoological Society of London and the Journal of the Linnean Society were retrieved, all these still have to be sorted out. The same applies to the two pallets with boxes containing books and journals on botany. Present was also the largest nature-printed iconography of plants ever published. 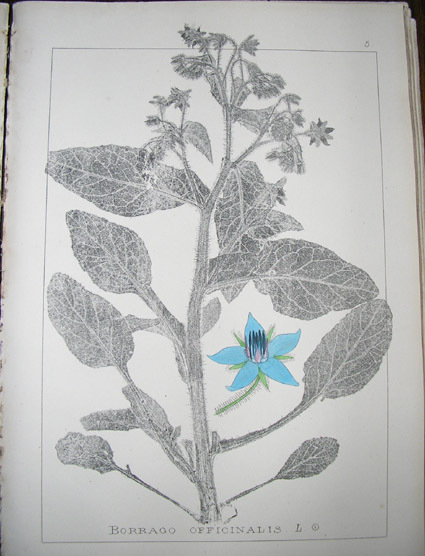 The ‘’Herbier de la Flore Française. Procédé de reproduction dit Phytoxygraphique’’ by Cusin & Ansberque. All together 25 volumes were published with 4763 plates. The plates are reproductions of actual specimens and give a ghost-like ephemerical appearance of the plants. The flower details are separately drawn at the bottom of the plates and mostly handcoloured. Copies of this work are very rare and seldom offered for sale. Unfortunately only about 15 of the 25 volumes were present, a few more were in a very bad condition. One of the more interesting items found in the W&W pile were two pencil sketches. 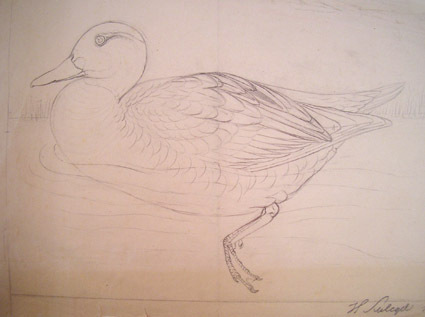 One of a duck and one of a dove which were both signed H. Schlegel and dated 1848. Dr. Chris Smeenk of the National Natural History Museum in Leiden was studying the Schlegel family’s history, and was told that I had the two plates. 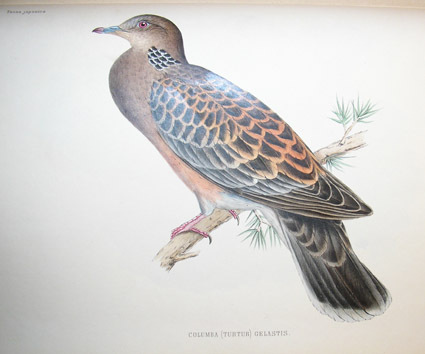 I showed him the plates and indeed they were made by Hermann Schlegel (1804-1884) a great ornithologist and former director of the Leiden Museum. 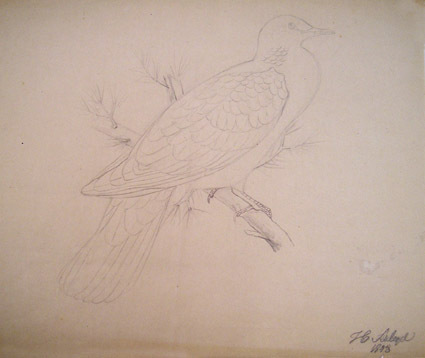 Smeenk thought they could be early sketches for the bird part of the famous Fauna Japonica, and comparing the sketches with the printed plates we soon found that it was indeed so. 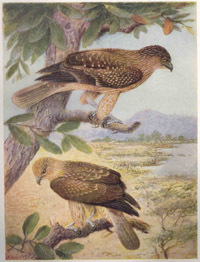 The sketches are of Columba (Turtur) gelastis figured on plate LXb and published in 1848, and of Anas formosa figured on plate LXXXIIc which was issued in 1850. The first 20 plates of the Fauna Japonica were drawn by Joseph Wolf all the others were presumably drawn by Schlegel himself, but until now there was no proof of that. Recently I used some of the W&W material to supplement a catalogue on marine mammals, terrestrial mammals and herpetology, all of which were well received. Next will be catalogues on Fishes and Birds (due early 2006). I recently acquired the library of Dr. E.J.O. Kompanje. Dr. Kompanje has been studying cetacea for many years and has published papers on the pathology of several species and historical papers on cetacea strandings on the Dutch coast. As his interests have shifted to other fields, he preferred that others might benefit of the books he amassed during many years. His comprehensive collection of books and papers has been the basis for a specialists catalogue on Marine Mammals which was just issued. 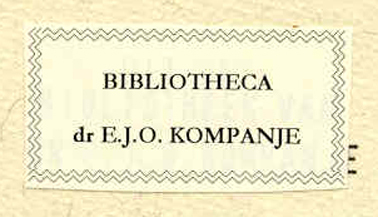 In this catalogue Kompanje's library was supplemented with titles from the Wheldon & Wesley overstock recently acquired in England (a separate news bulletin will soon appear).